Kitchen and Residential Design: Have you seen this fridge? One of the more enjoyable parts of being a blogger is the relationships I get to cultivate with PR and Marketing people from all over the place. These are symbiotic relationships and it's interesting to be part of a rapidly changing media landscape. So yesterday I got an e-mail from Sandra Bauman, from Bauman Research and Consulting. I participated in a study on induction cooking with Sandra over the summer so she knows I'm an appliance kind of guy. This time however, she's looking to talk to people who own a very specific LG refrigerator. 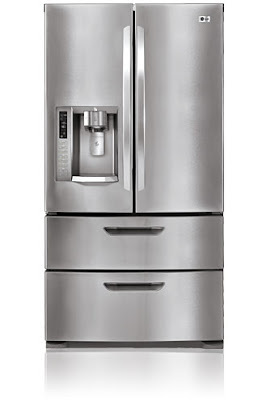 The refrigerator is 2009's LG LMX 28987ST, 4 door model. I have never specified one but I agreed to help find someone who has one. So, anybody? If you have one and are willing to talk to a market researcher about it, let me know. Thanks!